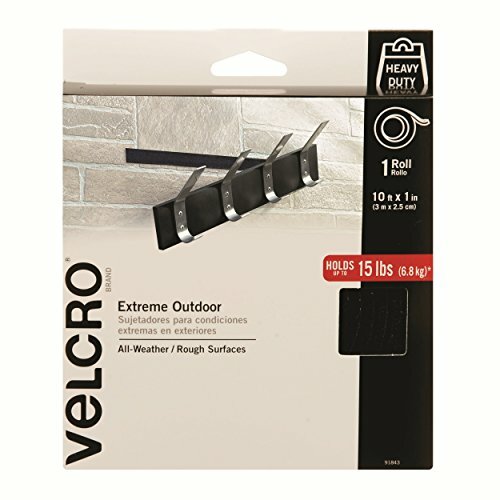 VELCRO Brand Extreme Outdoor fasteners feature an all-weather, UV-resistant adhesive for rough surfaces including concrete and certain types of brick. Superior holding power meets the requirements of demanding indoor and outdoor applications without drilling, nails, screws or epoxy. VELCRO Brand fasteners with heavy duty adhesive are recommended for indoor or outdoor use on most smooth surfaces, including plastic. Note: Recommended for temperatures between 0 and deg,F to 150 and deg,F. Not recommended for fabrics, dashboards, flexible vinyl or underwater use. Continued exposure to full sunlight can damage fastener. May not adhere well to certain types of brick and ndash, testing is recommended. Professional grade adhesive. Unmatched versatility. Ultimate tool for organization, mounting, hanging, storing and much more. Our tape will adhere to almost all surfaces! It is even water resistant. Use it indoor and outdoor. This Industrial Strength Extreme Sticky Back tape is designed for tough applications. Features UV resistant adhesive. Stronger adhesive, longer lasting and more durable than other brands. Designed to stick to a wide variety of surfaces. Great for the home, shop, garage and office! Use our Industrial Strength Extreme VELCRO in place of traditional fasteners such as screws, nails or epoxy. If you have any questions about this product by VELCRO Brand, contact us by completing and submitting the form below. If you are looking for a specif part number, please include it with your message.